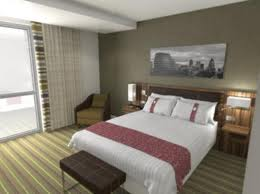 This is my review of the Holiday Inn Stratford City hotel in London, at the Westfield shopping centre. I wrote last week of my experiences on ‘£20 per night’ promotions at the Ramada Docklands and the Holiday Inn Kensington Forum. Last week, I set out to review my final £20.12 property – the brand new Holiday Inn Stratford City. And I liked it. On the face of it, Stratford is on the fringes of London. However, the massive investment in transport infrastructure for the Olympics puts it within spitting distance of pretty much anywhere. You have the Jubilee and Central underground lines, national rail services into Liverpool Street, two Docklands Light Railways lines, the high speed national rail service into Kings Cross AND the London Overground all passing through. And the walk from the station to the hotel is about 2 minutes. Add in the fact that the hotel is part of the massive Westfield Stratford City shopping and leisure complex, and you certainly don’t need to worry about going hungry or running out of supplies during your stay either! The top five floors are a Staybridge Suites property (also part of Priority Club) which offers only suites with cooking facilities and proper living areas. The next five floors comprise the Holiday Inn. Half the rooms face the shopping centre, half face the Olympic Park, with views of the stadium and the swimming pool. What really strikes you about the hotel is the light. I was on the 7th (top) floor of the Holiday Inn facing the Olympic Park. The room directly faces into the afternoon sun and light floods the room. With snow on the ground, it was a great outlook. Again, as you can see, it is bright and light with a thoroughly modern look. It could not be further removed from the beige horror of the Holiday Inn Kensington Forum! I had no major complaints at all, although having the toiletries in dispensers with a 2-in-1 shampoo and shower gel is not ideal. Sadly, my Priority Club Platinum status did not go too far. Perhaps being on the 7th floor counted as an upgrade? I didn’t get an Executive Room – although I had no use for the mini-bar, robe and slippers (although the free water would have been handy), and the rooms are the same size. There is no executive lounge or pool. I got a free copy of the ‘i’ newspaper delivered to my door, but I’m not sure if that was a Platinum perk or not – and in any event there are copies in reception anyway. I did get a voucher for a free drink. This appear to be a perk for ALL Priority Club members – the voucher has a picture of a blue card on it as well as gold and platinum – which is a lesson that you should ALWAYS sign-up for the loyalty scheme of any hotel you visit. Even the basic level can have perks! The hotel was advertising a drinks reception with the management team every Tuesday evening for PC members who are staying at the time. The bar and restaurant looked very modern and welcoming, although – apart from claiming my free drink – I didn’t spend any time there. All in all, I will conclude my review by saying that I would have no qualms about staying at the Holiday Inn Stratford City. It went up from 15,000 to 25,000 points in the recent Priority Club devaluation, but you can still book at the 15,000 point rate until March 18th if you call up. The Staybridge Suites property on the higher floors is 35,000 points a night, which includes free breakfast and free wifi. You can find out more about the hotel, and book, on this page of the Holiday Inn website. The T&Cs for upgrades specifically mention a higher floor being an uograde! When I stay at the HIE Sheffield (my neck of the woods also) they always give me the top floor and this means I can look across the main road at the HI perched on the side of the hill which you stay in! No other upgrades as Platinum, no free parking or wi-fi, no kit-kat, even the free i newspaper is available to all in the lobby. At least the reception staff remember my name!